Continental Airlines has a daily flight to St.Maarten from New York (Newark) in high season - off season flights going twice a week on Monday and Wednesday. 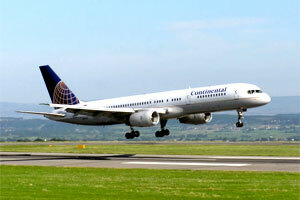 Continental Airlines, Inc. (Continental) operates more than 2,700 daily departures, together with its wholly owned subsidiary, Continental Micronesia, Inc., and regional flights operated on its behalf under capacity purchase agreements with other carriers. As of December 31, 2006, Continental flew to 136 domestic and 126 international destinations, and offered additional connecting service through alliances with domestic and foreign carriers. Continental operates in two segments: mainline and regional. The mainline segment consists of flights to cities using jets with a capacity of greater than 100 seats, the regional segment consisted of flights with a capacity of 50 or fewer seats.